One of Madrid’s most popular museums, the Reina Sofia Museum houses an exquisite collection of Spanish modern and contemporary art. On this 2 to 2.5 hour private tour, your guide will lead you to the most important works, revealing the fascinating stories behind each one. You’ll skip the line so that you won’t miss a minute while visiting Madrid. Part of a former hospital, the Reina Sofia became gallery space for 20th century art back in the 1990s. 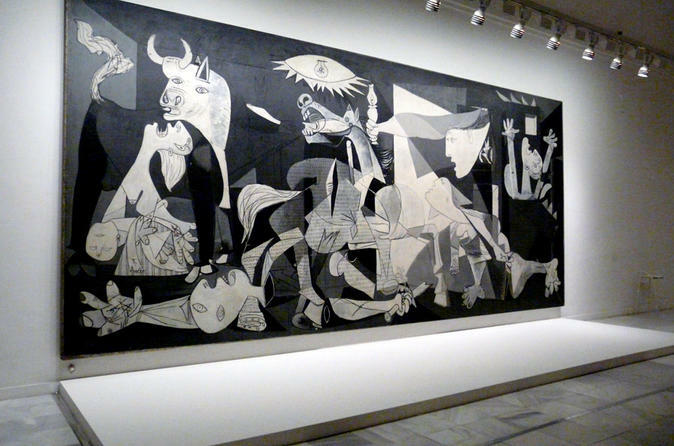 On this tour, your guide will introduce you to the different artistic movements showcased here, including abstractionism, cubism, surrealism, and modernism. You’ll come face to face with works by the iconic Pablo Picasso, including his world-changing painting, “Guernica.” You’ll browse works by Joan Miró, like “The Man with a Pipe,” and Salvador Dali’s “Face of the Great Masturbator,” learning about the techniques and strategies they used to create their oftentimes quirky works of art. You’ll discover all about the social and political movements that shaped these artists and their work, including the Spanish Civil War. You’ll leave with a richer understanding of 20th century Spanish art, allowing you to wander confidently through one of the world’s largest contemporary art collections.